Thomas Wharton, 1st Marquess of Wharton (1648-1716), Nobleman and politician. Sitter associated with 20 portraits. 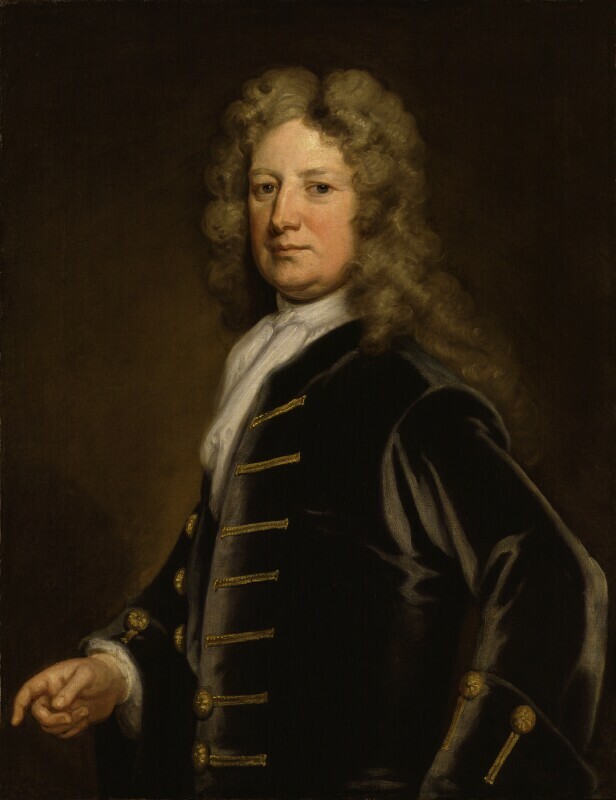 Henry St John, 1st Viscount Bolingbroke flees to Paris - following his part in secret negotiations around the Treaty of Utrecht in 1713 - where he becomes foreign minister to the Pretender, James Stuart. First Jacobite Rebellion begins in Scotland against the rule of George I. The Pretender arrives from France. Total solar eclipse is seen across southern England; the last total eclipse visible in London for almost 900 years. Artist Jonathan Richardson publishes The Theory of Painting, credited with being the first significant work of artistic theory in English. Poet Alexander Pope begins his acclaimed translation of Homer's Illiad Architect Colen Campbell creates interest in the Palladian style in Britain with the publication of his Vitruvius Britannicus. Louis XIV of France dies after seventy-two years on the throne. He is succeeded by his five-year old grandson, Louis XV. British build a permanent factory in Canton, China.